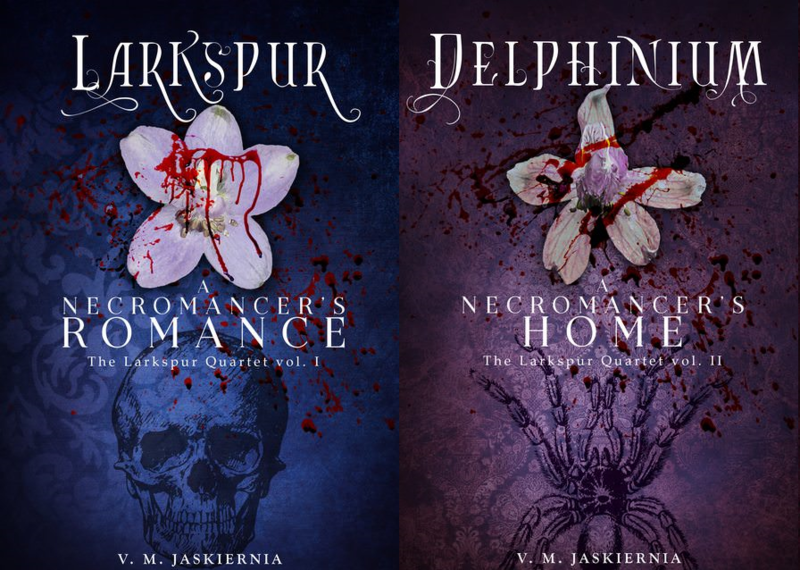 I have not forgotten about Larkspur’s sequel, Delphinium. I’ve been working on it lately, rearranging a few scenes, figuring out where to write more and whose POV I want to use. Mostly I’ve kept it in Pierre’s head, but I want a good amount of it to be through Lizzy’s eyes as well. To a lesser extent we get to see more of Wolfram and a few characters that were mentioned in Larkspur- Eglė, Morgaine, Piers, and Aimé comes back along to help his foster-brother. Not to mention all the people who were left to counsel Pierre. Seems inheriting a duchy comes with a lot of things to do. I think I mentioned this before but I’ve changed the sub-title from A Necromancer’s Love to A Necromancer’s Home, the main ‘theme’ evolving enough that I didn’t want to box it in so tight. The romance, and Pierre’s love of necrocræft, is still among the main pillars (which is what the Love referred to), but this story is more than just that. It’s about Piques as a whole, the duchy that has not had much luck with its ducs, which is so close to Faery and so mistrusting of the fée. For both myself and Pierre it seems there’s so much more to the world than we’ve noted before. In terms of Scenes I am working on one set in Noctua, a land I’ve not mentioned before, but it isn’t overtaking my thoughts like Delphinium is right now. I know I started the Scenes with the intent to be able to show off other lands, then proceeded to stay in Clandestina for half of them, but they are truly helping worldbuild in a way I didn’t think about before.